Neighborhood Council Feature Presentation 8/16 7pm Come Join Us ! Home/Front Page/Neighborhood Council Feature Presentation 8/16 7pm Come Join Us ! Los Angeles is part of 100 Resilient Cities, a worldwide effort pioneered by the Rockefeller Foundation (100RC) that is dedicated to helping cities around the world become more resilient to the physical, social and economic challenges that are a growing part of the 21st century. Members from the 100 Resilient Cities team will be presenting the campaign in Los Angeles, and will discuss how Neighborhood Councils play an important part in making LA resilient. During a disaster, your neighbors may be your closest source of help. Are you and your neighbors prepared to respond and help each other? 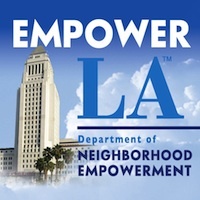 The City of Los Angeles is developing a program called Ready Your LA Neighborhood (RYLAN) to help your family and your neighborhood prepare for disasters. RYLAN gives you the steps to take immediately after a disaster to help keep you and your family safe. It provides the tools to prepare and organize your neighborhood to respond together in that first hour after a disaster to reduce injuries, protect your property and the environment, and most importantly, to save lives. We’re building the capacity of individual families and businesses — both to prepare for and recover from emergency events, and build long-term financial security. We’re also seeking to cultivate and grow L.A.’s future leadership, by partnering with young Angelenos to advance equity and stewardship in our communities. When disaster strikes, we know that recovery starts in our local communities and networks — and we need to further empower and engage our neighborhood organizations to foster local resilience and social cohesion. These local networks also play a critical role in climate adaptation for our most vulnerable communities. We’re also taking action to reduce local health and wellness disparities while increasing economic security for all Angelenos. We are setting measurable goals to build our City’s leadership in resilience, integrating tools and technology to prioritize our most vulnerable in decision-making, and fostering faster and more efficient disaster preparedness and recovery. We’re also modernizing our city’s aging infrastructure for the future, and developing ways to provide more safe and affordable housing to improve economic security of Angelenos. Our work doesn’t stop at our city’s borders. We recognize the role we play globally, as part of the 100 Resilient Cities network, and the leadership we can provide to our region and beyond. We will continue to uphold principles of climate resilience as a city, and will engage our public, private and philanthropic leadership to be a model through advocacy, infrastructure investment, and partnerships. Resilient Los Angeles charts a path forward, toward a safer, more equitable, and prepared Los Angeles. Below are a number of steps you can take today to become a resilience-builder. These steps will help you increase your personal preparedness, and gain the education and training necessary to be a resource for your family, neighbors, city, and region in times of need. READY YOUR L.A. NEIGHBORHOOD (RYLAN): Review Ready Your L.A. Neighborhood resources atemergency.lacity.org/rylanRYLAN gives you the steps to take immediately after a disaster to help keep you and your family safe.